Okay, so wayyy before I ever started cooking, especially before I started cooking with beer, this was pretty much the only thing I knew how to make. Along with scrambled eggs with instant mashed potatoes, which I would make for myself when my mom was sick. We had the Great American Favorite Brand Name Cookbook (published in 1993) at my house growing up. One day when I was a kid I chose to make the "easy chocolate truffles," and then that was the only thing I made for a long time. So I added Maduro Brown Ale from Cigar City into the mix. The chocolate and coffee notes in this beer make it a really good choice. Pairing it with the chocolates is also nice because it's not overly sweet, and the roastiness allows you to go back for another bite of chocolate without being overwhelmed with too much sweetness. I cooked the beer down a bit so that the extra liquid wouldn't change the texture of the chocolates too much. 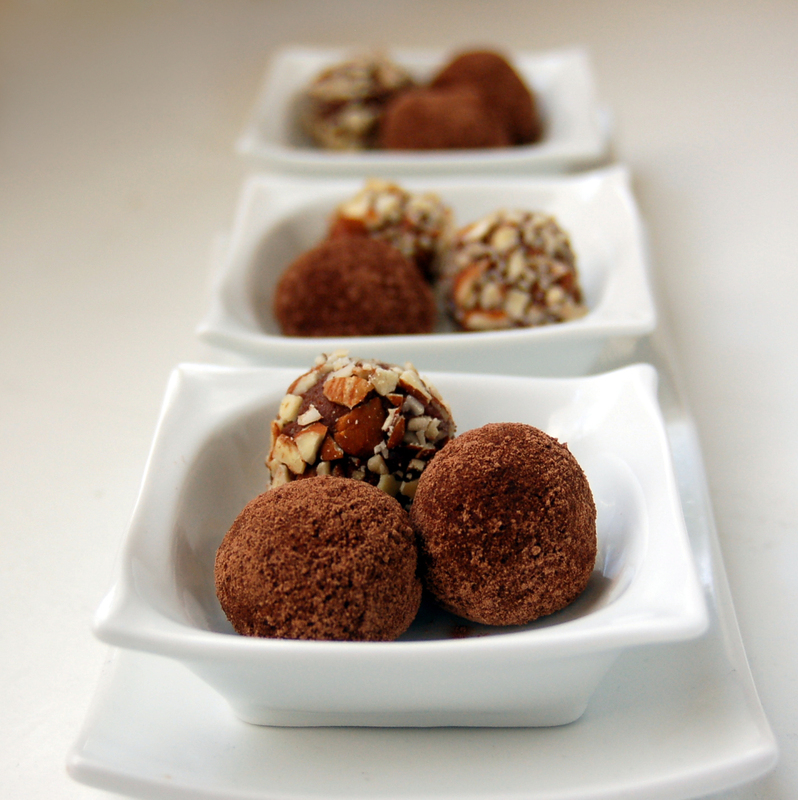 Although I suppose they aren't technically "chocolate truffles" (more like fudge or chocolate cheesecake balls), they sure look fancy and taste yummy and would pair great with many beers. I had them with a framboise once and it was wonderful. Additionally, if little nerdy 10 year old me could make them, then so can you. I was going to include a picture of me at that age, but I felt this post looked pretty with the chocolate pictures and I didn't want to taint it. So here is the recipe, adapted from the Great American Favorite Brand Name Cookbook. This makes about 50 truffles so you may want to cut the recipe in half. Beat cream cheese until smooth (make sure it's softened or you'll break the beater!). Gradually add sugar, beating until well blended. Microwave chocolate for 1 minute and stir. Add 30 seconds at a time, stirring in between, until melted. Don't rush it or you'll burn your chocolate and have to go buy new chocolate and start over. Place the beer in a small saucepan over medium heat. After about 10 minutes it should reduce down to about 1/4 cup. Mix in the chocolate, beer, vanilla, and instant coffee. Refrigerate for at least an hour. Shape into 1 inch balls and roll in topping of your choice. Keep refrigerated.